Koran Kaltara newspaper has the opportunity to join the group from WWF Malinau, North Kalimantan to explore the two biggest rivers in North Kalimantan. Cruising along the two largest rivers in North Kalimantan, from Tanjung Selor and heading towards the Bahau sub-district in the Malinau District, this reporter felt somewhat apprehensive, particularly being a novice in crossing the two biggest rivers in “bumi benuanta” (“our land”, the name locals use to refer to the North Kalimantan area) for the first time. Certainly, he was visualizing running into a big rapid, as told by the Malinau community in the upstream part of the river. The Koran Kaltara newspaper had the opportunity to join the group from WWF Malinau, North Kalimantan, on a trip by motor boat or Longboat, as the frontier villagers called it, together with villagers from Long Alongo and Apau Ping, travelling from Tanjung Selor at the end of the Arab Village. Before entering the Bahau Hulu River, we were presented with splendid views along the Kayan River. Shady trees and pieces of boulders as if carved were revealed at every turn of the Kayan River. We enjoyed this beautiful natural panorama for 8 hours straight. After enjoying such natural beauty, the group arrived at a three-way river crossing connecting with the Bahau River. 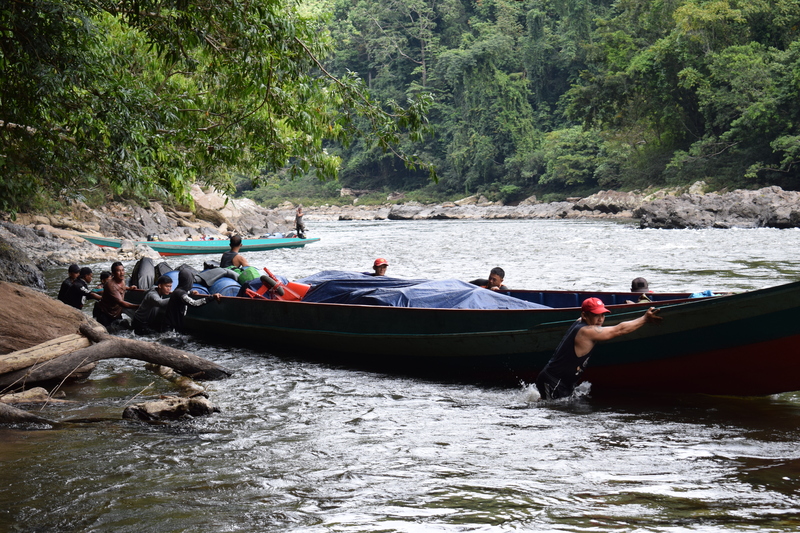 Before continuing, staple goods brought by Mr. Viktor were first sorted into another longboat waiting at the Bahau crossing. 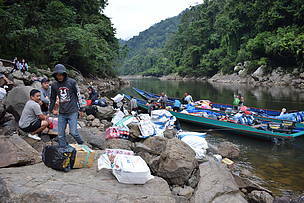 “We stop for a while to unload the goods,” said Viktor, a villager from Long Alongo. After sorting the staple goods into the other longboat, the group, split into two longboats, continued the journey passing over the currents of the Bahau River at low tide. “At such low tide it will probably take longer to arrive”, he said. Nevertheless, our journey towards Long Alongo continued. Halfway after entering the Bahau river area, we encountered a strong rapid and passengers had to get out. “We must get off the boat, sir, as there is a strong rapid up ahead”, said the motorman of this longboat. One by one, finally the longboats carrying passengers made it through. We had gone through the first rapid, and proceeded with our journey by going through the smaller rapids. Then we were back again on this Bahau River, with the sun high over our heads. We didn’t feel the passing of the day’s journey because of the forest hue around us and beyond the trees were rock walls neatly arranged and garlanded with ever greens. Taking pleasure at such views of natural beauty, we didn’t feel that time was already pointing to 17:00. The other longboat had overtaken us and apparently had gone ahead to the rest stop. The longboat we rode stopped at the banks to rest. 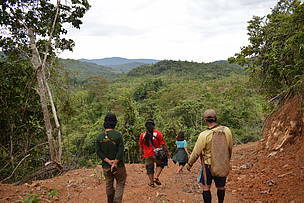 One of the Bulan villagers explained that the journey would continue in the following morning. “We can actually continue, but up ahead are many rapids, especially the latest one. So we must stop overnight”, he told us. To reach the village of Long Alongo the capital of Bahau sub-district, from Tanjung Selor the capital of North Kalimantan, apparently required 48 hours or 2 days traversing the Bahau River. After an overnight stay in Andras, the Longboat motormen got ready for the trip to Long Iran Village, Pujungan sub-district. Without delay, the passengers hurried one by one into the Longboat with the load of staples neatly stacked and covered with canvas. The sound of rushing water and the chirping of wild birds around the forest accompanied our trip, along boulders covered in clear water. 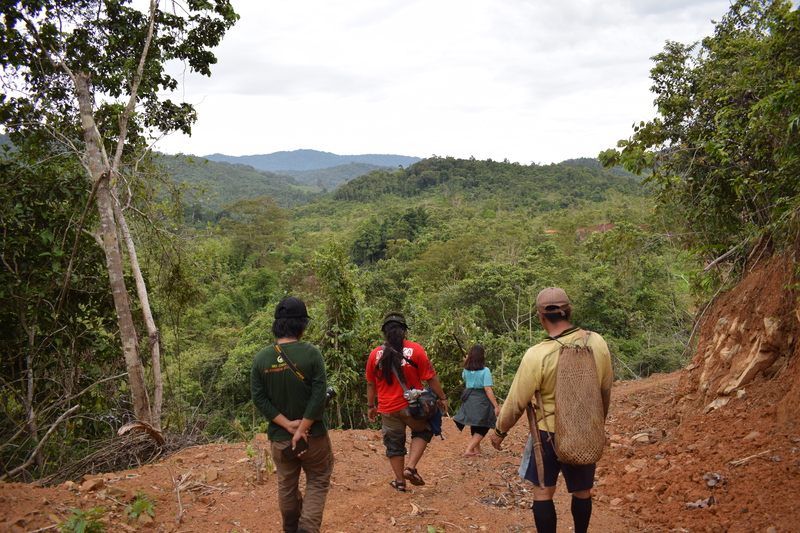 We felt a deepening atmosphere as our journey took us into the Giram Baru area, Pujungan Sub-district. Boulders reached high beneath the currents of this Bahau River. Every now and then the boulder-spotter at the front of the Longboat extended his hand with a long pole to disperse the water splashes and to prevent the front of the longboat from hitting the big rocks. An hour later, we encountered a rapid named Giram Baru, or new rapid which, according to previous motormen, did not have much rock beneath it. They blasted it a few months ago, but the pieces came together again. ‘’Yes, that is the rapid that was blasted just a few months ago” exclaimed Yosep while unloading goods onto a stack of boulders. One by one goods such as mineral water, dozens of eggs and various staples were unloaded to lighten the load of the Longboat to traverse the new rapid. “These goods must be unloaded, otherwise the Longboat cannot take the rapid”, commented Bulan as she took documentation with her cell phone. After dropping the load, the first longboat made a start. At the front of the Longboat, the boulder-spotter was expertly directing the motorman to avoid the rocks. “So after unloading the goods, the longboat is able to get through,“ he uttered. 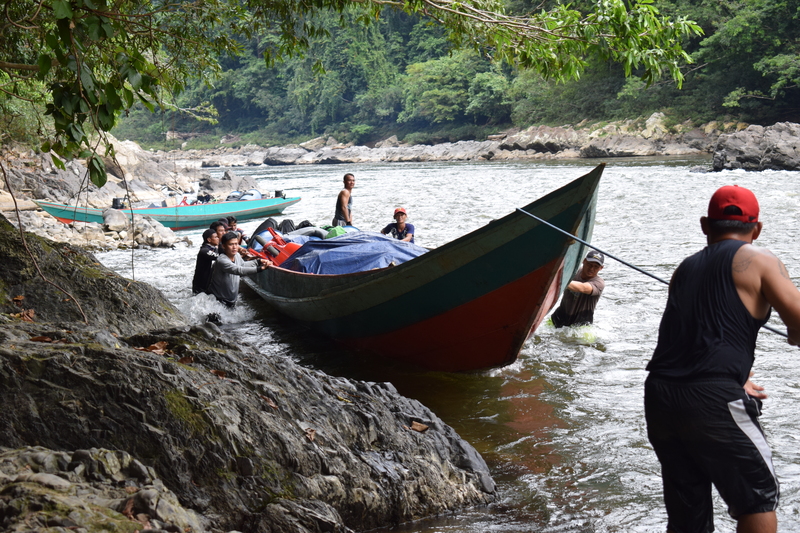 According to him, the motorman on this longboat had experience confronting the rapids in Bahau River. ”Indeed, one must have experience. If not, we can quite easily hit the boulders,” he said. This trip was full of challenges but felt light. The reason being, behind what could still be called virgin forest, sat a big rock of a pyramid shape, at this time wrapped in the morning mist. “That is the rock mountain in the shape of a pyramid,” explained a villager from Long Alongo. The natural environment of the Bahau River kept showing us its beauty. Not feeling the passing of time, together with the other group of villagers we arrived at the Long Iran Village, Pujungan sub-district at the border with Peso sub-district, Bulungan District. 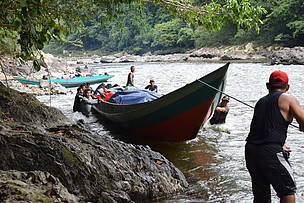 Afterwards, to reach the capital of the Bahau Hulu sub-district which is Long Alongo village, we no longer travelled by longboat because of the low tide of the river and switched to using small open motorboats, called “ketinting”. As many as 5 ketingtings proceeded with the journey, each loaded with staples and 2 passengers, towards the destination of Alongo which would take five hours. Rivers with streaming rapids are the main water transportation course used by the hinterland and border communities in every village in the Pujungan and Bahau Hulu sub-districts, Malinau Distsrict. Cold air blanketed our journey towards Long Alongo Village when we were there. We went over a number of streaming rapids present at every village in the Pujungan and Bahau Hulu sub-districts, and saw such clear water covering the grey rocks. The characteristic of Bahau Hulu is its water transport, traversing the wild realm of the Bahau River as its main route, much like the transportation heart beat for the communities in the hinterland and border areas. One reason being that the land route is not yet readily accessed. “Amazing rapids and lovely natural environment,” remarked Novi, a reporter for Antara Kaltim, occasionally taking pictures of the community going about their activities while driving their ketinting. The Bahau community depends on the river as the connection between villages, which in total numbers 15 in the 2 Sub-Districts. “The overland route is open but cannot be used yet because it is still a dirt road. We can only pass it in the dry season,” said Mathius the ketinting driver. We heard the sound of rippling water calling to each other, and not only that, the chorus of ketintings echoed behind the lush forest along the banks of the Bahau River. Everlasting green nature was to the left and right of these long rapids as if splitting the forest in two parts. It is not only the small rapids that are ready for the adventurers who want to enjoy the natural environment of this Bahau River. As we arrived at the Long Alongo Village, beyond the “Welcome to the Long Alongo Village” gate hid a view of green mountains like a painting by the Creator, as we trod our feet onto a terrace with wooden walls clad in carvings typical of the dayak culture. The Long Alongo village was so lovely with rows of flowering plants at every street. Moreover, the community was friendly and greeted every guest who came visiting this village. Alas, the clock pointed to the hour of 18:00, time to rest for a while as on the next day we would continue the journey to Apau Ping Village, with its million enchanted natural beauty and its long grass field in Long Tua. After enjoying such natural beauty, the group arrived at a three-way river crossing connecting with the Bahau River. After sorting the staple goods into the other longboat, the group, split into two longboats, continued the journey passing over the currents of the Bahau River at low tide. Nevertheless, our journey towards Long Alongo continued. Halfway after entering the Bahau river area, we encountered a strong rapid and passengers had to get out. This trip was full of challenges but felt light. The reason being, behind what could still be called virgin forest, sat a big rock of a pyramid shape, at this time wrapped in the morning mist. 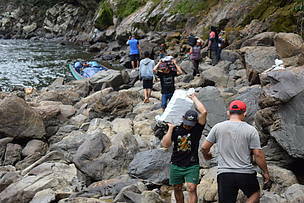 One by one goods such as mineral water, dozens of eggs and various staples were unloaded to lighten the load of the Longboat to traverse the new rapid.